LinkedIn is the world’s largest professional network site online, with more than 161 million members. Yes, more than 161 million! There are more than 2 million company pages and more than 4 billion searches were performed on LinkedIn last year alone. The numbers are staggering, and only continue to grow. Whether you’re new to LinkedIn or consider yourself a pro, imagine what it would be like to generate leads, grow a massive network, become an authority, build wave after wave of traffic and create massive profits… all using LinkedIn. 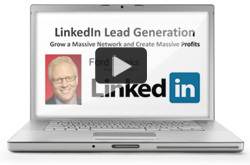 Join Ford Saeks, Business Growth Innovator, as he reveals the secrets to leveraging LinkedIn to help you grow your business.